Good morning everyone, I hope you are all doing well!! I am waiting for spring weather to appear in NJ but it hasn’t shown up yet. Hopefully soon, I think it may reach the upper 50’s by the weekend. I’ll take anything a bit warmer than the 30’s now. It has been a very hectic time at Cloches and Lavender. We have been packing for our move and I can’t believe how much we accumulated in 18 years in this home. We have been packing the kitchen for what seems like forever. Peanut and Reeses haven’t really enjoyed our packing, they can’t stand the noise from the tape gun. Every time we take a box out to put together they give us a look , like they are saying, we are out of here and make a run for it to my office which they feel very safe and secure. As you can see by the boxes piled up we are making some major headway. I have missed blogging but I have to get this done. I will keep you posted. On to other areas of the house now. Have a great week and I will have updates very soon! My goodness! When is the move? It’s so stressful. Hang in there. Glad to get an update, Cynthia. 🙂 Looks like you’ve gotten a lot accomplished! Thanks for the visit Kenley. We have gotten alot done and have much more to do. Oh that looks like sooooo much work! Thinking of you! It has been but, it has to get done. Thanks Stacy, for keeping me in your thoughts. Thankds so much for the encouragement. The unpacking is worrying me more then the packing. I am just so excited to move to the next chapter. You HAVE been busy Cynthia!! 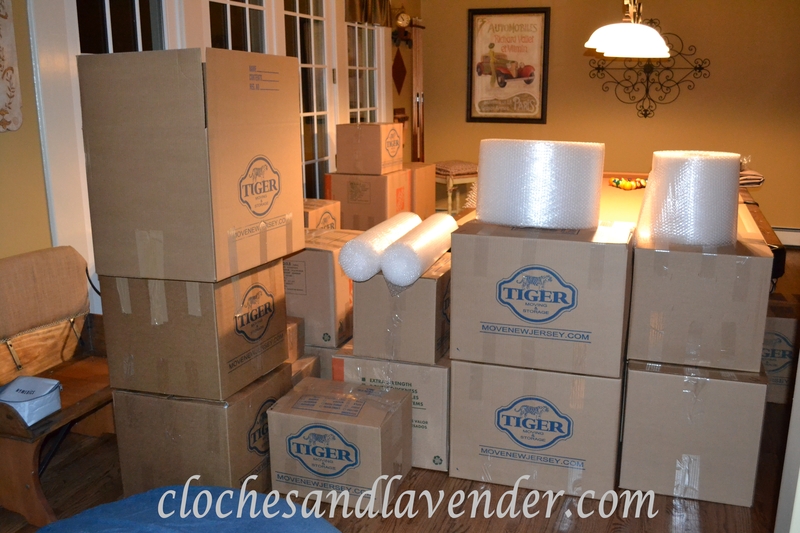 That’s a lot of boxes….but I can only imagine what it would look like when we would ever move! Not looking forward to our kitchen re-do in May….we’ll be packing things up and I’m sure be amazed what all is hiding behind those cabinet doors! That i just the kitchen and some stuff from our great room. We have many rooms to go and I haven’t touched the basement yet. We are building so we are going to stay with my girlfriend and her three pups for about 6 months while our gets built. We were going to rent but she said no way you stay with me! We are very lucky. So sorry to hear about your brother in law. Ours just past this last week also of lung problems. He was 72. Wow look at all those boxes. You will be so happy to be in your new home. You know you have to break a few eggs to make an omelot. We downsized 3 years ago to a raised bungalow. From 2500 sq ft. to 1500. Sure did a lot of purging. That is a great saying!! Thanks very much for the visit. I am going to keep everyone posted on what is going on with the house. Thanks sdo much Alycia. Our puppies are afraid of everything and that tape gun does them in every time!! Thanks for the giggle….Have a fantastic Easter!! Moving is hard work, I wish you all the best in your new home and in your in between home. Thank you so much we are looking forward to the move. Looks like you are making tremendous progress. Hope you have a lovely and blessed Easter! Thanks for stoppin by Ann and we are getting there. Looking at all those boxes reminds me of that commercial where the couple is looking for their cat, not knowing he’s in one of the boxes! We moved in December out of a home we lived in for 26 years and you know what? I don’t miss it at all. This is a new chapter for us, and for you too Cynthia! Change is good, and you will make your next home every bit as lovely as the home you’ve had all these past years. But moving is such a pain! We had less than two weeks to pack up items from a 2500 sq ft home plus the attic, shed and garage AND find a new place to live. We spent Christmas Day unpacking! lol. And did I mention our new place is half the size, so we had lots of stuff to get rid of? Not my idea of fun. Oh, and we get to do it again in December because we are just renting until then. Deep breaths. It will all be over soon and you can relax! I am not looking forward to unpacking but I am excited about getting our new home built and being on one level. It will be great for me! We won’t be in there for at least 6 or 7 months but my dearest friend is letting us stay with her. We offered to rent but she wouldn’t hear of it, we are so VERY lucky!! The best of luck Cynthia!!! 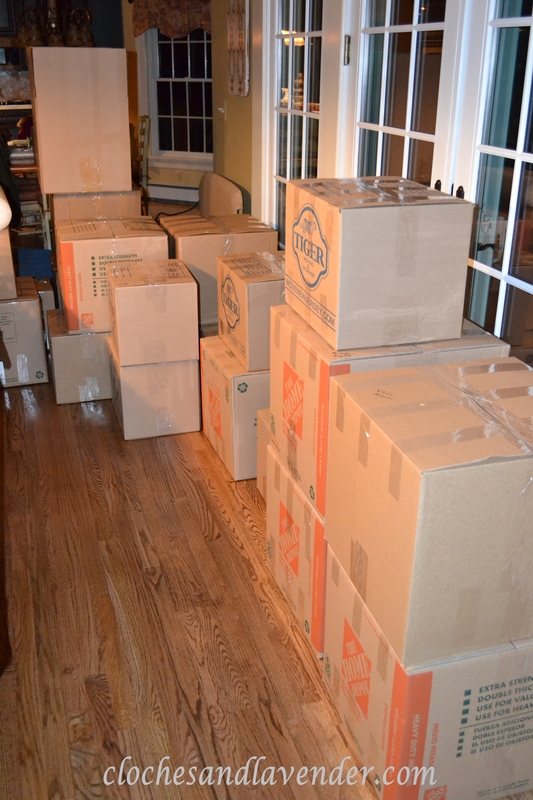 Thanks so much…..good luck to you if you decide to move! You certainly have your work cut out for you…it must be bittersweet leaving a home that you have been in for 18 years, but then exciting to move on to a new home that will fit your lifestyle so much better…congrats on the move Cynthia! It is bittersweet but it is the best thing for me. Exciting too. Cynthia, so happy that you found ‘the’ spot for your new home. It sounds lovely. I know that your home will be beautiful just like your last. Started installing the cupboards in our basement today. Always the exciting part! Thanks for stopping by Jann….we are waiting for blueprints now and I will be posting about it when they are done. Still packing….. doing the pretty stuff is the most fun. Good luck with the cabinets.